In the vineyard this month, we are in the process of injecting zinc and calcium into the soil to promote root growth that secondarily benefits the plant canopy. Additionally, we are doing some extensive suckering. 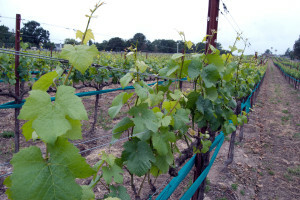 This procedure of clipping the sucker canes is necessary to eliminate those that take away nutrients from the vine and shoots that produce fruit. Canopy management, which entails leaf thinning, is important as it allows more sunlight to the fruit providing better ventilation and growth. This is essential as a natural form of mildew prevention leading to quality grapes.